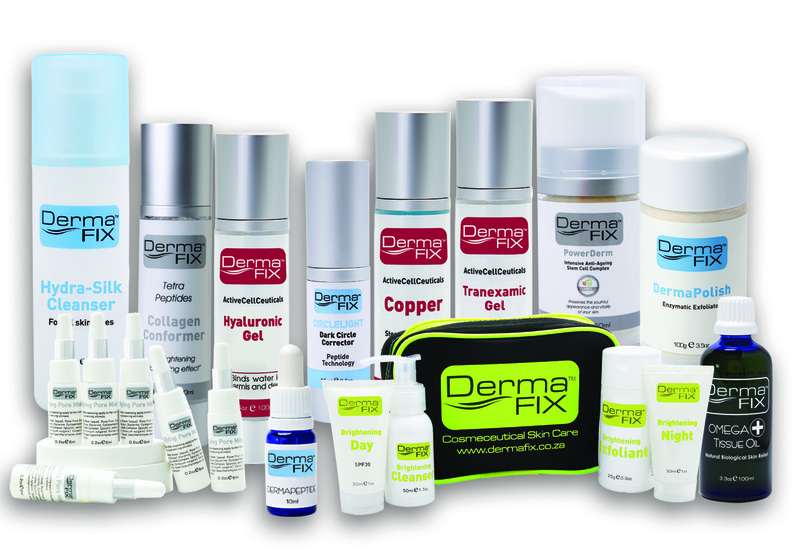 DermaFix Cosmeceutical Skin Care provides Advanced Products specialising in Anti-Ageing, Hyperpigmentation, Acne, Scarring and Stretch Marks, embracing new proven technology as it develops. Our Skin Care solutions and In-Clinic Treatments with clinically tested ingredients provide measurable, scientific results for the correction, prevention and protection of the skin. Cleansers are carefully formulated to pave the way for beneficial and thorough removal of make-up, sunscreens and general daily dirt. Enzyme exfoliation compliments the skin for a smoothing and brightening of the complexion. This deep cleansing oil-free formula thoroughly removes excess oil, surface impurities and make-up. Helps to exfoliate dead skin cells due to Alpha and Beta Hydroxy Acids with natural enzymes. Directions: Apply to face with moistened hands, gently lather then rinse. Double cleanse if make-up is used. Follow with appropriate toner and moisturiser. Not for use over eye area. Can be used as a body wash on breakout prone areas. Brightening Cleanser is composed of actives, which inhibit melanin production reducing the appearance of pigmentation, age spots and helps inhibit the formation of new pigment while lightening the skin without being an irritant. It is particularly useful to attenuate hyperpigmentation, glycation and other signs of premature skin ageing. Directions: Apply twice daily leaving the cleanser on the skin for a few minutes before rinsing. For darker areas of the skin, mix a ¼ teaspoon of DermaFix Ultra XFoliant with DermaFix Brightening Cleanser and gently massage over the body for beautiful glowing skin. Follow with appropriate toner and moisturiser. This unique blend of organic enzyme rich powders, micro-exfoliates and cleanses the skin, leaving it noticeably smoother and brighter. DermaPolish is packed in dry form to maintain its effectiveness and freshness. Water activates the enzymes together with hydroxy acids, smoothing, softening and brightening the skin. Lightly exfoliates dead cells and accelerates cell renewal. Decant one teaspoon of DermaPolish into the palm of the hand and activate by adding an equal amount of water. Lightly massage onto the skin’s surface, then rinse with tepid water. Mix DermaPolish with water to form a paste, apply to the skins surface and leave on as a brightening masque for 10—15 minutes. Moisturising the skin is vitally important to protect the skin barrier from degradation and the ageing process. Humectants are natural moisturising factors, the mainstay of skin care products for all skin care concerns are used in combination with various lipidic emollients used to lubricate very dry skin (xerotic skin). This highly effective, lightweight cream is recommended for all skin types including blemished and problematic skin of any age group, as well as sensitive skin types. A complex of natural botanical extracts, vitamins, and amino acids help to moisturise and balance the skin, while natural Vitamin B Complex (Yeast Extract) helps to regulate oil gland secretion to reduce the possibility of clogged pores, inflammation and breakouts. D-Pathenol stimulates skin healing whilst providing deep moisturisation needed to combat sensitive skin. Directions: After cleansing and toning, apply twice daily. The DermaFix ACC Range consists of serums with active ingredients which are liposome encapsulated allowing for better product penetration. This potent range benefits all skin care concerns. Transepidermal delivery of Tranexamic Gel using the Microneedle Roller in the treatment of Melasma. Safely inhibits the growth of tyrosine and the activity level of melanin in problematic, hyperpigmentation skin concerns. Directions: Twice daily application of Tranexamic Gel on clean skin, rub vigorously to aid penetration. Tranexamic Gel may be layered with chosen moisturiser or as prescribed by your Skin Care Professional. Plumps and Hydrates the Skin providing anti-ageing benefits. Hyaluronic Acid is a highly concentrated anti-ageing, moisture binding and skin repairing facial treatment. Hyaluronic Acid naturally occurs in dermal tissue and is a highly hydrophilic, gel-like substance in which the fibrous proteins collagen and elastin are embedded, thereby keeping them supple and flexible. Reduces fine lines caused by dehydration. Apply to thoroughly clean skin, rub vigorously to facilitate penetration. Optional: To Increase product penetration apply DermaFix MT2 Microneedle Roller for home use. ACC Hyaluronic must be stored sheltered from light and heat. It is not necessary to refrigerate ACC Hyaluronic Gel. Within the Corrective Range are moisturisers and serums specific to correcting skin care concerns. Specific use of carrier systems represents a real asset for the delivery of antioxidants to the skin and can include various types of liposome encapsulated formulas. MelanoDerm contains a unique skin lightening complex. The micro-active ingredients contained in MelanoDerm are clinically proven to inhibit Tyrosinase activity responsible for dark marks. Directions: Twice daily application on clean skin. After daytime application of MelanoDerm, it is mandatory to shield the skin against harmful UVA, UVB sun rays. DermaFix Corrective Eye Complex combines Apple Stem Cell Technology with powerful Peptides and Hyaluronic Acid. Corrective Eye Complex prevents free-radical attack which leads to a chemical change called cross-linking. The combination of Apple Stem Cells, Hyaluronic Acid and Rice Peptides increases the longevity of skin cells, resulting in a reduction of lines and wrinkles. Directions: Apply Corrective Eye Complex under the eye area and extend outwards towards the temples. Ensure thorough application for optimal results. Apply morning and evening. May be used on the upper lip. DermaBright’s unique blend of active essential ingredients produce visible skin brightening results within days of regular application. Mandelic Acid accelerates the biological process of peeling the skin and helps control skin care concerns. Week 2: 2-3 drops into moisturiser leaving on the skin at night only. From here on, work on your individual skin tolerance level, a cotton bud may be used to treat spot areas if entire face is not affected. Extreme hyperpigmentation may be resolved at a quicker pace by additional application of MelanoDerm over the DermaBright. High Protection Sunscreen must be used daily (not negotiable) when using DermaBright. Anti-ageing correctives are a new generation of liposome encapsulated active ingredients which combat the signs of ageing. Expression lines found on the face are caused by the contraction of muscles, creating facial expressions on the forehead, around the eyes and mouth area. Environmental exposure causes severe damage which can be alleviated with the correct DermaFix skin care products. PowerDerm protects and stimulates the mitochondria enhancing the ATP (energy) levels of the skin cells. Collagen synthesis is stimulated, combating chronological ageing. Plant Stem Cells are used to Protect Skin Stem Cells. Brightens the skin whilst reducing age spots. Directions: Apply PowerDerm over cleansed skin morning and evening, rub vigorously – concentrating on areas of visible ageing to restore resilience and strength on face, neck, décolleté. This highly active product is suitable for all skin types with visible signs of ageing. DeCelerate contains actives that inhibit the SNARE complex formation and activate the natural process of tissue repair. These Peptides stimulate fibroblasts to synthesize Collagen and Elastin fibres. Use an exfoliator for an increased product penetration before applying. Apply DeCelerate twice daily. Friction movements facilitates penetration onto target area. 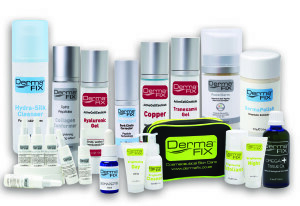 DermaFix have a variety of Masques offering luxurious therapeutic benefits to the skin. Specific to skin care concern these masques additional to their individual benefits will rejuvenate and repair the skins barrier ensuring supple, soft and refined skin with the use of enzymes, vitamins and anti-oxidants. Enriched healing clay gel masque for deep cleansing of impurities and oil control. 10 to 15 minutes then rinse thoroughly with warm water. Use once or twice a week or as a targeted treatment masque i.e. the T-zone application. High in sterolins which are reputed to improve the appearance of age spots, sun damage and scarring. Vitamin Therapy Masque offers super moisturisation. Directions: Applied as a masque for a soothing treatment by hand or brush technique. Leave on for 15-20 minutes. Remove with tepid water, and follow with moisturiser. May be left on the skin overnight to soothe and heal. May be applied to hands and body as a leave on treatment. The active ingredients of sunscreens are compounds that absorb, reflect or block ultraviolet light with the use of active ingredients such as Zinc Oxide and Avobenzone. Sunscreens are regulated. They’re rated based on their Sun Protection Factor (SPF); the higher the SPF, the better the protection against sunburn. Our sunscreen provides true high UVA/UVB protection. This revolutionary product contains transparent Zinc Oxide, which protects skin from the damaging UVA rays proven to be responsible for premature signs of ageing. Stability – doesn’t degrade in the sun. Directions: Direct sun application for example outdoor activities, apply liberally every 2-3 hours for safety and re-apply after swimming or perspiring. Under make-up application, excess product application will result in a temporary white residue lasting +- 20 minutes. Roll-Patting motions recommended rather than spreading. Rubbing decreases efficacy. DermaShield SPF 50 sunscreen provides high UVA/UVB protection. This scientifically advanced product contains a proprietary blend of sunscreen ingredients which protects skin from damaging UVA/UVB rays. Directions:Apply generously before sun exposure. Re-apply frequently. Re-apply after perspiring, swimming or towel drying.